In the olden times, when a girl got married, they would have to bring a fortune (dowry) to the farmer’s son. Her father would go to town and make the deal. There would be a good sum of money involved. Then, when they got married, the girl had to do all the work to help out. She had to milk the cows and feed the calves and the pigs. They kept a lot of hens and the eggs had to be collected. They bought all their groceries with the eggs. No fancies were bought. They made all their own butter and baked their own wholemeal bread. No ranges or electric cookers then. 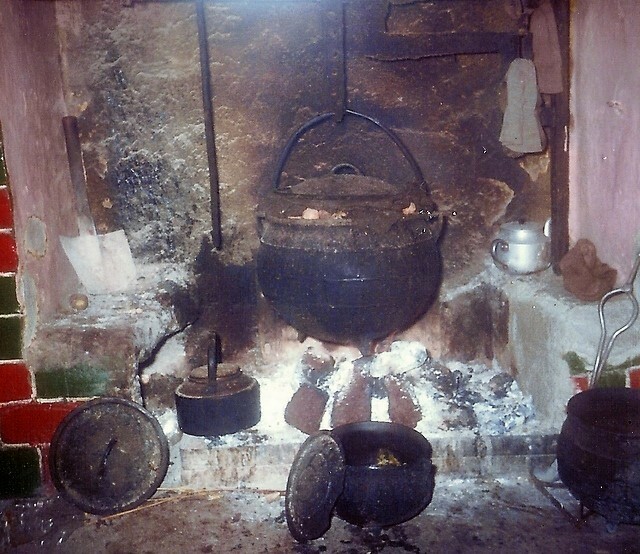 Bread was baked in a pot oven with coals under and over. I can smell it yet. Hard to beat it, with a lump of homemade butter! They never bought a pot of jam. They made their own with whatever fruit was in season – gooseberries, blackberries, rhubarb and apple. They also made their own wine usually from elderberries. They grew all their own crops – potatoes, oats, barley, cabbage, turnips, parsnips and carrots, cauliflower and cabbage plants. So they were all self sufficient. There are no such things now as fortunes. Farmer’s sons are glad to get a girl. Girls nowadays want an easy life with electric cookers, washing machines and dryers. How times have changed! Thank God for it! This page was added on 17/03/2018.